During the rule of John Hyrcanus II (63-40 BCE), an Idumaean convert to Judaism - Antipater - was appointed by Julius Caesar as the de facto administrator of Judaea. Idumaeans were descendants of Esau, living in Edom, a country bordering Judaea in what is now southwest Jordan, between the Dead Sea and the Gulf of Aqaba. Antipater chose his younger son, Herod, who was still only a boy, as governor of Galilee. When the last Hasmonean king, Antigonus Mattathias, was defeated and executed by order of Mark Anthony, Herod became the undisputed ruler of Judaea. When he was told that another “King of the Jews” was born, “Herod ... was exceedingly wroth, and sent forth and slew all the children that were in Bethlehem, and in all the coasts thereof, from two years and under” (Matthew 2:16). Herod’s coins feature innovative designs which, while not truly Jewish in character, at least do not feature any human likeness. However, it is on one of Herod the Great’s small bronze coins that a living thing is depicted for the first time since the Persian period. The eagle probably refers to the insulting golden bird that Herod placed above the Temple entrance. Objects pictured on rare Herodian coins include a winged caduceus and pomegranate, a plumed helmet and a shield, and an aphlaston (ship’s stern) and a palm branch. The largest coin of Herod also features unusual designs - a tripod holding a ceremonial bowl and a helmet with long cheek pieces, topped by a star. 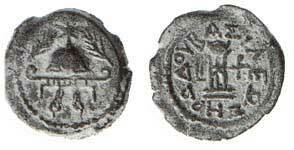 Other coins feature a crested helmet and a shield; also a cross within a diadem (a headband worn as a crown) and a tripod. The most common coin (prutah) of Herod the Great is similar to Hasmonean coins - an anchor with Greek inscription “HRwD BACI” (King Herod), and a caduceus between double cornucopiae.